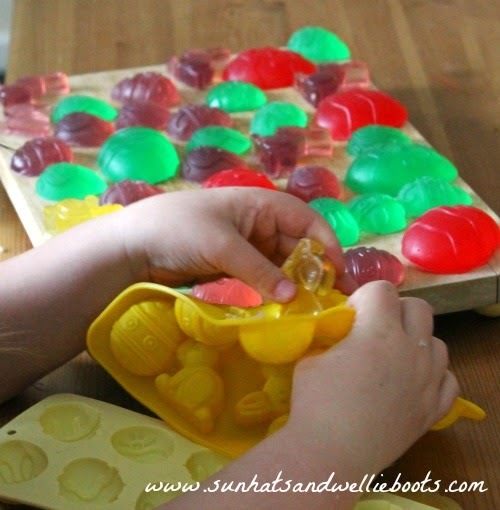 Looking for fun Easter gifts to make with the kids? 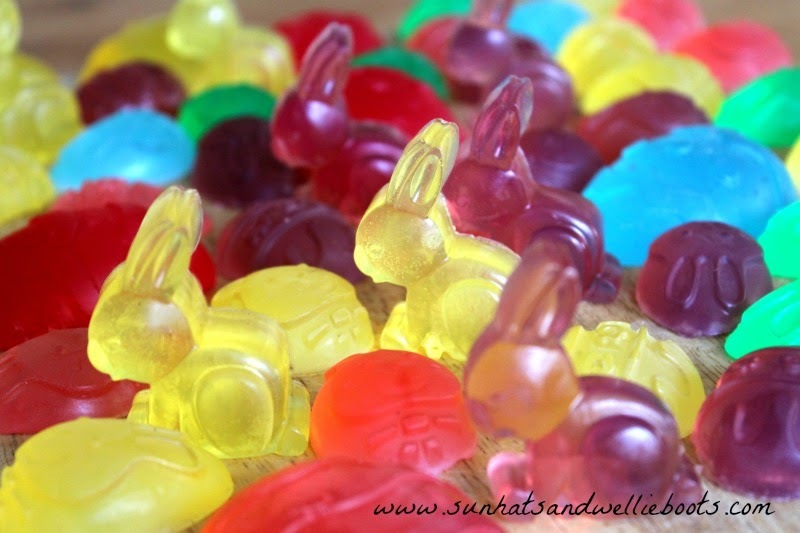 How about these cute & colourful little soaps. Start by cutting the block of soap into smaller chunks. 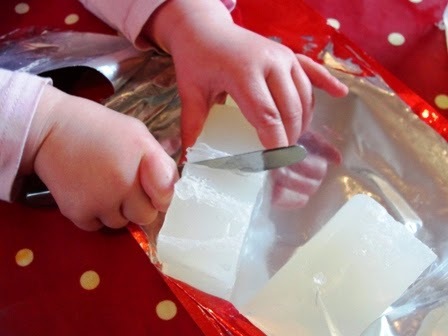 If you're planning to make only a few soaps you won't need to melt all the soap, so any leftover soap can be wrapped in clingfilm & stored away for another day. To make our batch of soaps which filled 4 trays we only used half the block of soap. If you're planning on making soap with lots of different colours you can make the soaps in one of two ways, it just depends on how many jugs (or containers with spouts) you have free to use. If you have enough old jugs for each soap colour you wish to use, then you can melt all your soap by adding it to the glass bowl & placing it over a pan of hot water on a medium heat. This takes a little time but gently stirring it occasionally helps the soap to melt. Once it has melted pour the hot liquid into the jugs & then add a couple of drops of your chosen dye to the jugs. We found less is more when adding the colour! 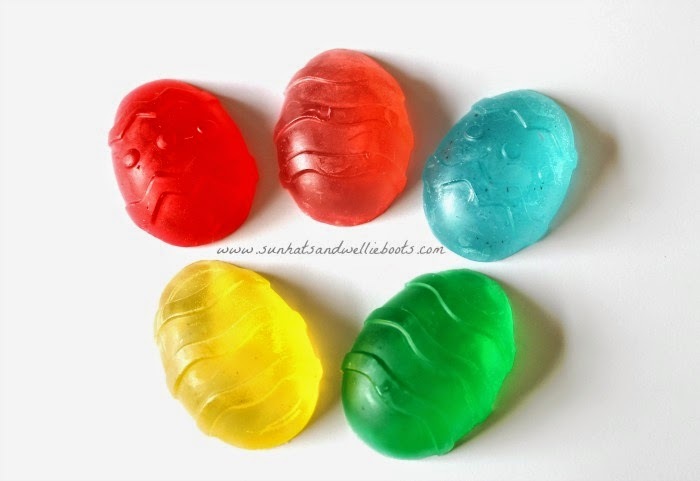 Mix the dye by stirring slowly into the soap & then pour into your Easter moulds. If you're adding a fragrance, then add a couple of drops of the essential oil onto each soap. 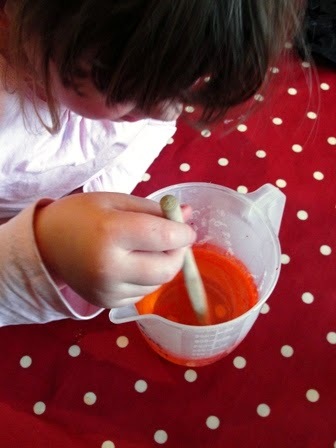 Alternatively, if you want to use lots of colours but only have 1 jug available, then just add 1 small block of the soap to the pan, melt following the same method as above (obviously this smaller block will melt faster) pour the melted soap into the jug & add the dye. Once you've finished pouring your coloured soap into the moulds, wash out the jug with warm water to remove any soap residue & dry thoroughly. 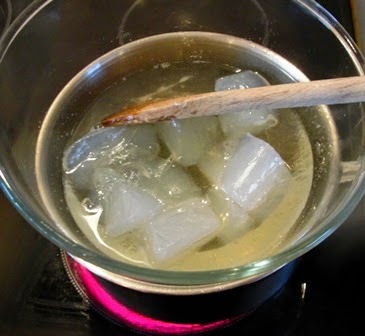 Add another small block of soap to the glass bowl & heat as before, repeating the process for each colour you wish to use. 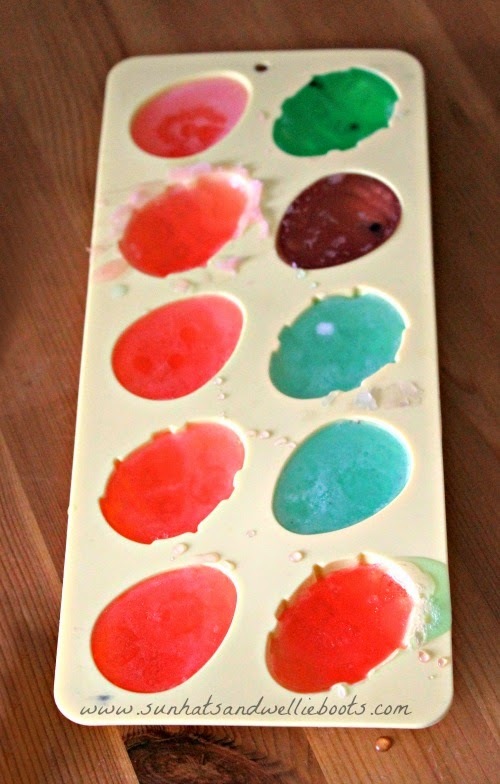 Leave the soaps to stand on a flat surface for a couple of hours to dry completely. Then gently pop them out of the moulds. This is always the magic part! As the silicone is so flexible the soaps come away from the moulds with very little pressure. If you're making your soaps to share as gifts they can be added to clear plastic gift bags, or wrapped in greaseproof/wax paper & tied with ribbon. We made several of these last year for friends & the soaps looked so pretty, we even had requests for more! If you're keeping these for yourself (& I don't blame you, they're beautiful) the soaps will need to be kept in an airtight container, away from sunlight. They should last for months like this, we still have some heart shaped ones that we made before Christmas & they look perfect. Once you've made a batch of these you can share them with so many people. 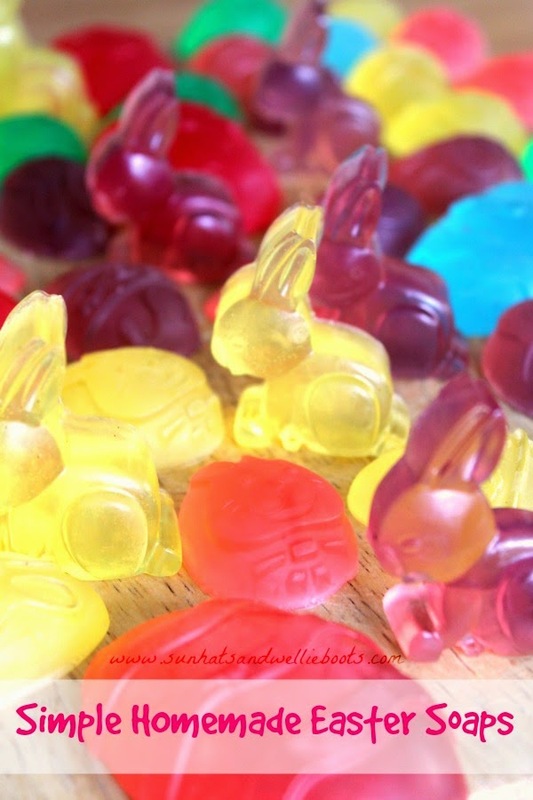 They make great gifts for classmates, neighbours, as well as prizes for Easter Egg hunts, & neat alternatives to Easter candy treats.